In the largest study of its kind, an international team of experts led by Newcastle University, UK, has shown that both organic milk and meat contain around 50% more beneficial omega-3 fatty acids than conventionally produced products. "Omega-3s are linked to reductions in cardiovascular disease, improved neurological development and function, and better immune function. "Western European diets are recognised as being too low in these fatty acids and the European Food Safety Authority (EFSA) recommends we should double our intake. "But getting enough in our diet is difficult. Our study suggests that switching to organic would go some way towards improving intakes of these important nutrients." 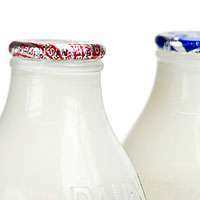 The two new systematic literature reviews also describe recently published results from several mother and child cohort studies linking organic milk and dairy product consumption to a reduced risk of certain diseases. This included reduced risks of eczema in babies. "People choose organic milk and meat for three main reasons: improved animal welfare, the positive impacts of organic farming on the environment, and the perceived health benefits. But much less is known about impacts on nutritional quality, hence the need for this study. "Several of these differences stem from organic livestock production and are brought about by differences in production intensity, with outdoor-reared, grass-fed animals producing milk and meat that is consistently higher in desirable fatty acids such as the omega-3s, and lower in fatty acids that can promote heart disease and other chronic diseases." "There is a relatively narrow margin between dietary Iodine deficiency (<140 µg/day) and excessive intakes (> 500 µg/day) from our diet which can lead to thyrotoxicoxis. "Optimising iodine intake is therefore challenging, since globally there seems to be as much concern about excessive rather than inadequate intake." The work builds on a previous study by the team - involving experts from the UK, US, France, Italy, Switzerland, Norway and Poland - investigating the composition of organic and conventionally-grown crops. This previous study - also published in the British Journal of Nutrition - showed that organic crops and crop-based foods are up to 60% higher in a number of key antioxidants than conventionally-grown crops and contained less of the toxic metal cadmium. "We have shown without doubt there are composition differences between organic and conventional food. Taken together, the three studies on crops, meat and milk suggest that a switch to organic fruit, vegetables, meat and dairy products would provide significantly higher amounts of dietary antioxidants and omega-3 fatty acids," concludes Professor Leifert. "We need substantially more, well designed studies and surveys before we can accurately estimate composition differences in meat from different farm animals and for many nutritionally important compounds (vitamins, minerals, toxic metal and pesticide residues), as there is currently too little data to make comparisons. "However, the fact that there are now several mother and child cohort studies linking organic food consumption to positive health impacts shows why it is important to further investigate the impact of the way we produce our food on human health. Or we could just take supplements, and stay with less expensive food. The most important statement in the entire article is the LAST line. It nearly invalidates the headline which says CLEAR DIFFERENCES. Apparently the author of this article did NOT read the last line. "The authors highlight that only a small number of studies have been carried out comparing organic and non-organic meat, and that even significant results may still carry a high level of uncertainty." At best this is a trend which may or may NOT have any significance. But it is reported as gospel and will be read as gospel. Everyone by now should know that anything organic is better than any lab made food. Sometimes you don't need science to know these things. Once in a while try using common sense. Do adults really still drink milk? The findings are great. I am happy I spent a little extra on my kids milk. As for me, not happening. Has there ever been any studies on the intake of supplements vs intake of vitamins directly from the source? Ive always been curious if the body utilizes the vitamin intake better when taken from the source, the idea being that the other parts of the fruit/vegetable/meat allows the body to digest and use the vitamins in a more efficient way. Or maybe the reverse is true? I kind of thought that because we have evolved to eat these products over millions of years that our body would be better at making use of the nutrients. Perhaps because they are in combination or just by the very fact that our digestive system has adapted to breaking them down. I dunno. Just a thought. And lets not forget the high incidence of Bovine growth hormones in non-organic milk.. The so-called health benefits of antioxidants have been shown to be at least mainly if not entirely scientific myth based on badly flawed small scale studies that don't filter out other causal factors for health. One reason for antioxidants having little if any health benefit is because most types of antioxidants are either chemically broken down (as in destroyed ) by digestive juices in our stomachs or cannot be absorbed through the lining of our gut; either way, they don't enter our blood so cannot benefit our body cells. Even for the antioxidants that can enter our blood, the health evidence is variable and sometimes indicating HARMFUL effects on health. ...And yet I see links like this STILL unscientifically propagating the dangerous simplistic flawed implicit health message that antioxidants are simply 'good' for your health. The phrase "non-organic [food]" is a complete nonsensical BS to any chemist or biologist. And should be such for any human with high school. There's no need to add more to that.